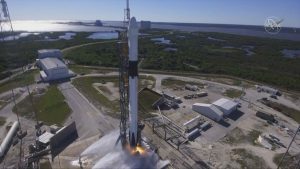 CAPE CANAVERAL, Fla. – Just two days after a successful launch from California, SpaceX has sent another rocket into orbit in an effort to deliver a payload to astronauts on board the International Space Station. The Falcon Nine Rocket lifted off from sunny Cape Canaveral, Florida carrying one of the company’s Dragon Cargo capsules. The capsule is filled with 5,600 pounds of food, water, supplies and experiments for the six-member crew of the International Space Station. It is expected to arrive at the ISS Saturday morning. As for the Falcon Nine, the rocket reportedly landed in the Atlantic Ocean on its descent to earth instead of the landing pad in Cape Canaveral. SpaceX CEO Elon Musk issued a tweet saying a malfunctioning hydraulic pump the cause of the Falcon 9’s emergency water landing. He added the rocket did not suffer any significant damage and it may be used for an internal SpaceX mission in the future.